Once again William Rauscher has used his prolific research and writing capabilities to produce a fascinating and entertaining book of the World Famous S.S. Adams Company. This book provides a visual tour of a historic institution that has built its success with the joy buzzer, dribble glass and a variety of pranks and popular magic tricks for over 95 years. Hundreds of line drawings and photographs adorn over 150 pages of this attractive book. Hard Bound, Full Color Cover, Over 150 Beautifully Printed Pages. Contact 1878press@gmail.com for ordering information. "Rauscher has captured the history of a company that is surely a part of Americana. 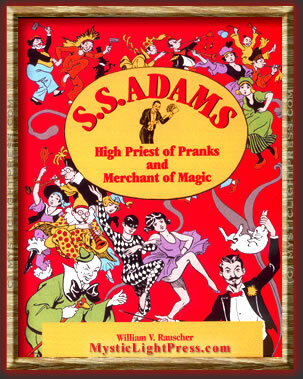 This book is a nostalgic and delightful journey for all of us who remember our magic tricks and joke items labeled S. S. Adams." Yesterday, the S.S. Adams book arrived and I have been on Cloud 20 ever since. S.S. Adams played a much greater role in my start as a boy conjuror than I had ever known until now. The book is a feast of sheer nostalgic delight. I love it! William McIlhany - Magic Historian, Collector and Magic Films expert. Bill Rauscher has provided a glimpse into the very fine meshing of conjuriana and Americana with his newest tome. This book will stand for the ages showing the value of entrepreneurial spirit mixed with fun and hard nosed business sense. Ben Robinson, Performer, Author, Magic Historian. William Rauscher has written an excellent account of how Soren Sorenson, who became S.S. Adams, created a thriving and successful business out of making joke and novelty items that brought a smile, a laugh, and even a "guffaw" to millions of people. The story is intriguing...a very good read..